Judy Hatcher is the executive directory of Pesticide Action Network North America. 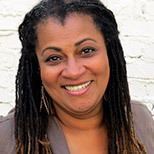 Since 1981, she has worked as a grant maker, a program manager, a consultant and a trainer for social justice groups all over the country. Previous employers include National People’s Action, Amnesty International USA, the Funding Exchange, the Crossroads Fund, the Community Resource Exchange and the Center for Community Change. She was a consultant with the Grantsmanship Center and the Women of Color Fundraising Institute, among other organizations. Most recently, Judy served as Director of Programs, then Executive Director, of the Environmental Support Center, which helped build the capacity of environmental justice and advocacy organizations around the country through grants and other resources.